3. Broken, damaged, or missing design elements. 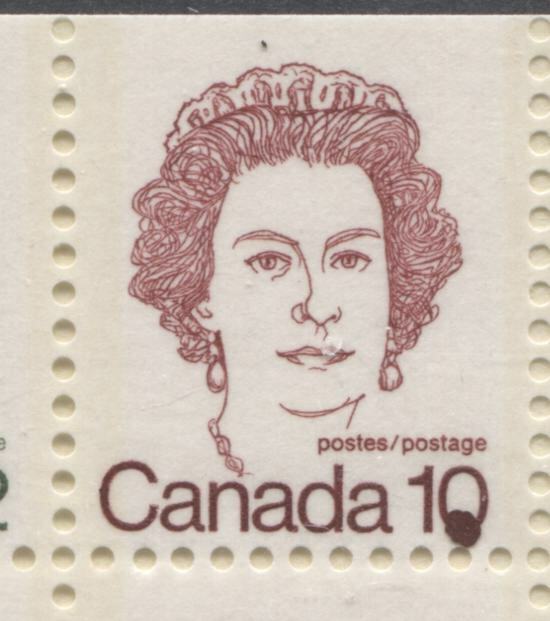 The broken Tiara, damaged 1, missing 1 are some of the better known ones on the booklet stamps. 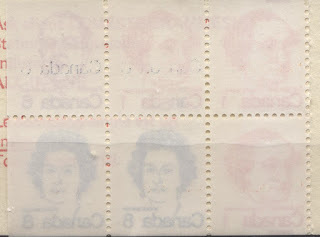 However, the sheet stamps can be found with damaged lettering on the BABN printed sheet stamps.Interestingly, while I have found lots of these types of varieties on the BABN printed 8c, I have not ever found any on the BABN printed 7c. 4. 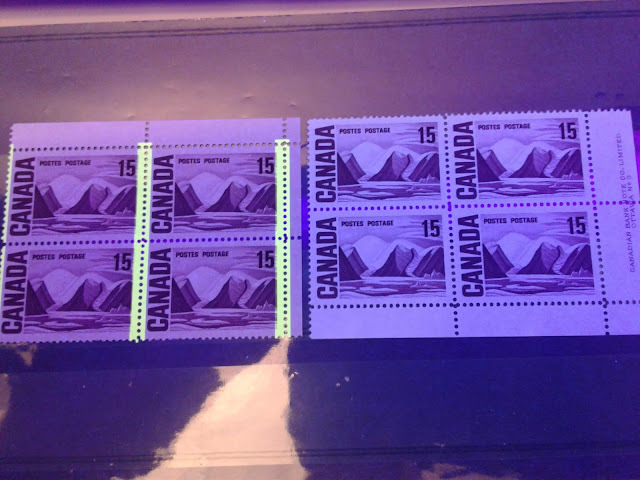 Ink migration from one stamp onto another when printed se-tenant in a booklet. Examples would be the orange in the Queen's hair, ultramarine on the lettering of the 1c Macdonald and 6c Pearson, and the red in Laurier's hair. 5. Reverse offsets of part of the designs caused by ink transferring to the back of stamps from another sheet that was not quite dry. Although many of the dot varieties are constant, this does not mean that if you have a complete sheet of 100 stamps that you are guaranteed a find. It turns out that many of these only occur on specific panes, and are only constant when all panes from a specific position in the press sheet layout are considered. 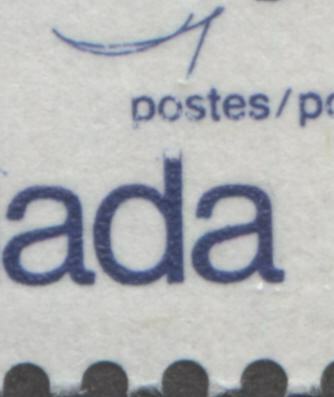 This shows the short "d" in "Canada". If you look carefully you can just make out where the top of the "d" is supposed to be. This is a reverse offset of part of the 8c inscriptions on the back of the pane contained within a 25c booklet. 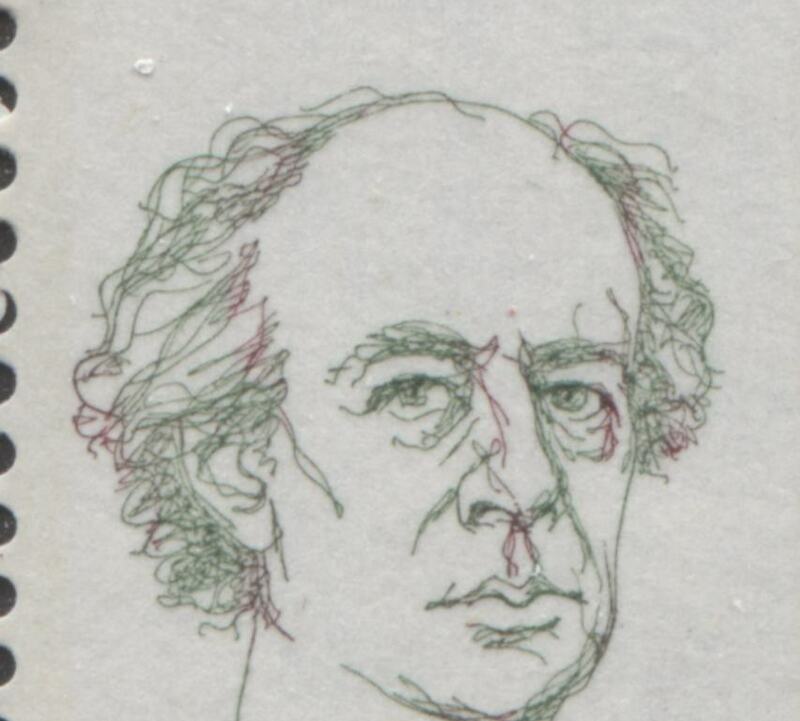 A vertical hairline variety on the 2c Laurier stamp. 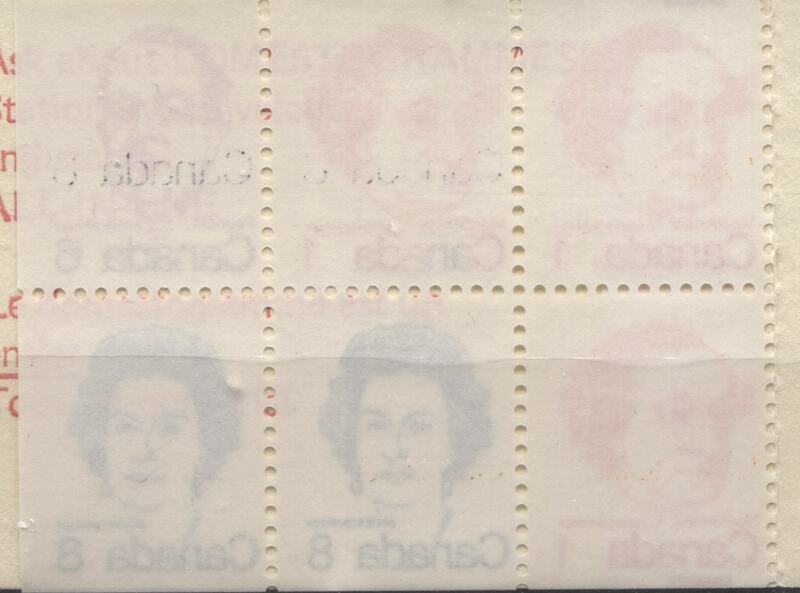 1c and 6c booklet stamps showing transfer of the ultramarine ink from the 8c value, which is discolouring the inscriptions. A 2c Laurier booklet stamp showing red hair, from migration of ink from the 10c stamps. A 10c booklet stamp showing a large red blob on the 10. These are just a few examples of the type of varieties that can be found on these issues. My post on my website this week lists the varieties that are specifically listed in Unitrade, describes them and contains other examples of varieties that can be found on these stamps. Sadly, I did not keep scans of all the varieties that I originally found, and I sold many of the varieties that I did find. So, this week's post has to be considered as a work-in-progress, which will grow, as I obtain more examples of varieties that I can scan.